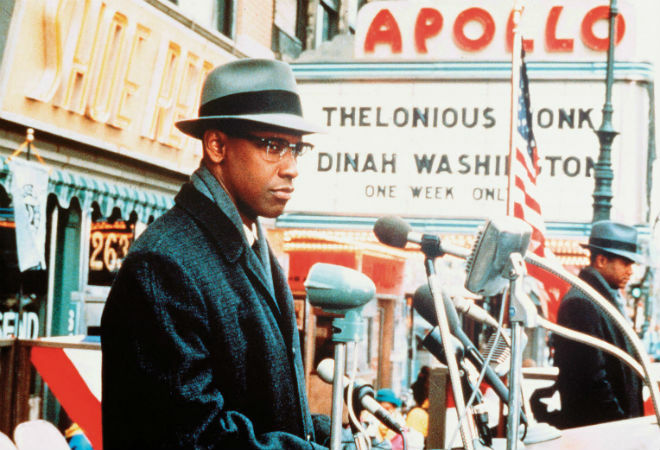 There are few character portraits in the history of cinema in the same league as Denzel Washington’s Malcolm X. The contradiction, at once ironic and grand, of Malcolm X is that it’s a thoroughly old-fashioned studio biopic made by indie maverick Spike Lee about an African-American radical living in a time during which everything felt revolutionary. In the works for a quarter century, with white directors from Norman Jewison to Oliver Stone attached or expressing interest, the project finally succumbed to the not unreasonable logic that it should be made by a black director; and coming off the phenomenon of Do the Right Thing and finally given the chance to make his dream project, with a script originally written by an uncredited James Baldwin based on a book by Alex Haley (Roots), Lee was disinclined to compromise on the three-and-a-half-hour epic he always imagined. In retrospect it’s hard to believe anyone could have thought any less running time would adequately capture the journey of one-time Malcolm Little (before his conversion to Islam) from criminal to convict to philosopher to minister to freedom-fighter to martyr, with evolutions along the way in his own thinking about racial relations in America. While the sprawling and passionate picture is stuffed with Lee’s bravura filmmaking, not least the vivid cinematography of Ernest Dickerson, its most inexorable virtue remains star Denzel Washington, who established himself as the great American film actor of his generation with not only the performance of the decade but one of cinema’s supreme biographical portraits; only Lawrence of Arabia’s Peter O’Toole and Lincoln’s Daniel Day-Lewis are in the same league. Next articleFoam Finger: It’s Tebow Time, L.A.